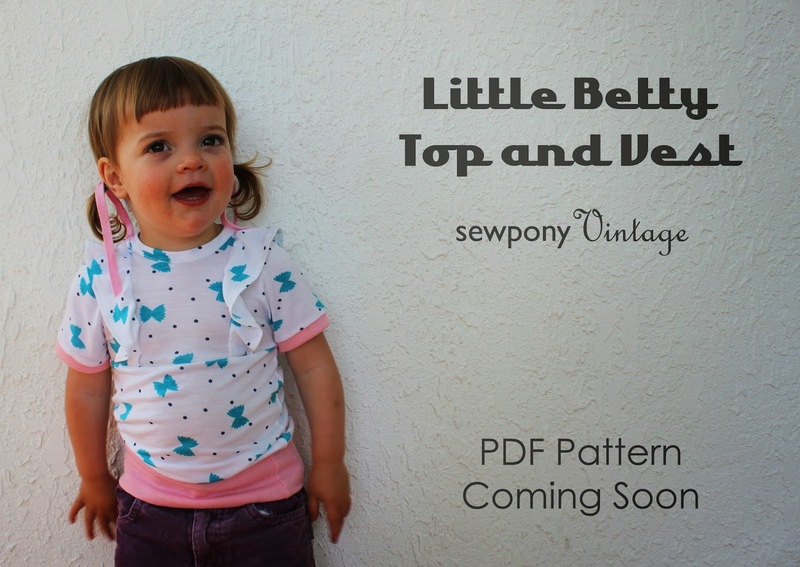 The Little Betty Top and Vest is a sweet little top with a ruffled frill that extends from the front bodice line to the back bodice line. 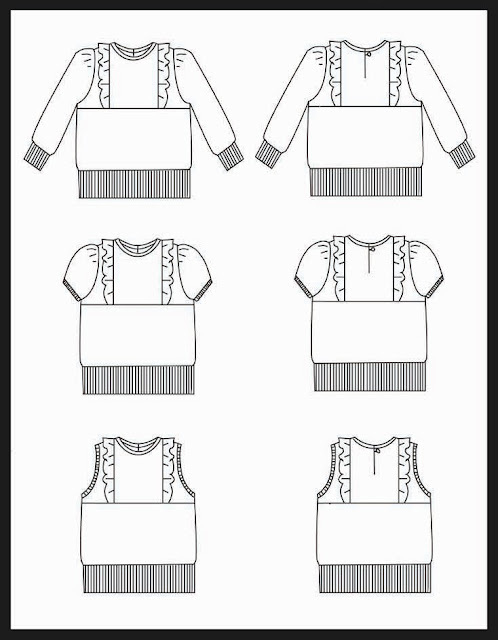 There is a button and loop closure at the back, wide waist band and three sleeve options - long with long cuff, short with short cuff (pictured) and sleeveless with short cuff. Sizes 12 months - 8 years. This version was made up in a super soft interlock. I think a slightly sturdier jersey may allow the frills to sit out a bit better, but I love the softness of this top. Emily is impossible to photograph...my photoshoots with her last about ten seconds because that's as long as she will stand still - and only if my 'big' girls are singing twinkle twinkle behind me and my camera! This button and loop is not what will feature in the pattern...I had the idea to create a tear drop shaped opening, but this only just fit comfortably over Emily's head, so instead, the pattern will have a longer straight opening (as shown in line drawings). This fabric is from Girl Charlee. The girls call it "Emily's pasta bow fabric". If you follow me on facebook, you will have read that I received it as part of my involvement with the most recent season of Project Run & Play. Two of the other knits I chose will be transformed in to the other two views of the pattern. I am hoping to work a lot on this pattern over the next week or two and get it ready for testing in about two weeks. My blog is busy each day between 1-12 December with Laura and my The 12 Days of Christmas series. So, if you are interested in reading more and seeing more about this pattern and possibly testing (there will be a long testing window due to the festive season), please follow me on facebook where I will be updating as I go. I would love to hear what you think of this pattern and if you would be interested in testing from around 10 -30 December. I will create a sign up form and tell you all about in over on facebook! 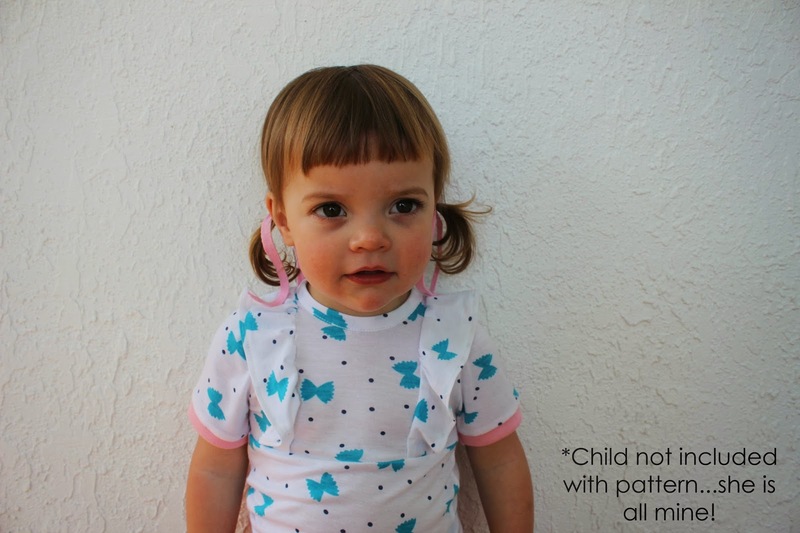 These new patterns you are working on are simply adorable Suz! I love them! This such a sweet top! And so great that you include different sleeve options (we could use some long sleeves over here at the moment). And yes, I would just love to test this one for you. Such a cute top! I love all the different options. Looks fantastic, can't wait to see more of the variations! Oh it is adorable Suz - wish I could test but this is such a crazy time I don't think I could deliver! Aahhh. So sweet! I really do love the ruffle and the closure in the back. This is so cute!! Would love to test for you! Cute fabric, and ruffles, and a hair ribbon to match, simply adorable. Twinkle twinkle little star magic :) The pasta bow fabric is very cute :) The pattern looks sweet Suz :) The ruffle makes it so girly, but I think this pattern (minus ruffle) can be used for boys as well. I would love to test for you. I have tested a few patterns now and always enjoy the challenge. I have heaps of experience sewing stretch fabrics as I used to make all our sons t-shirts when they were young. I now have two little granddaughters to sew for. So cute! Happy to test if you need anyone in the 12 months/18 months size. Such a cute top Suz! I can see why you added the disclaimer to the last photo too - what a cutie pie! This pattern is so cute! I have never sewn T's for my girls because I have never found a style that was worth the sewing effort, but this would make me change my mind. Would love to test it for you, I have a 6 year old and my twins are 2, and we are having a quiet at home holiday this year which means sewing time for me!